Last week impish tricksters $hit & $hine tore open a portal in the Heavy Metal Parking Lot for its inhabitants to drunkenly stumble and bad-trip through, finding themselves displaced far from home - no longer sat on the back of their pickup truck waiting for Judas Priest but instead plonked into the queue for Berghain. Bad Vibes indeed! We were also treated to the incredible Universal Beings by Makaya McCraven, most likely my favourite jazz album of the year! Split into 4 sections, the drummer took his beat-based band leadership to 4 cities – New York, his hometown of Chicago, London and LA - to collaborate with some incredible musicians local to each area. Amongst the amazing line-up, Brandee Younger steals the show to begin with; her Dorothy Ashby-esque harp vibes interplaying beautifully with cellist Tomeka Reid (who plays with Anthony Braxton, Jaimie Branch, Mary Halvorson etc). Shabaka Hutchings shows up in Chicago, before Nubya Garcia, Ashley Henry and Daniel Casimir continue to represent our city’s blossoming Jazz scene. Tortoise’s Jeff Parker helps close out the night with some of his signature post rock + jazz melding guitar playing. Overall a wicked and nice and varied double LP! Long live International Anthem!! Some very special bits this week too; big 4LP Brainfeeder Boxset blesses us with not only an amazing retrospective of the label’s treasure filled past but also grants us 22 unreleased tracks from their current roster, showing FlyLo and co. looking straight to the future. Keep your eyes out for a potential special announcement of some bonus goodies for a couple of lucky purchasers..
On a heavier psychedelic note, Riding Easy gold-pan a seventh volume of their unbeatable Brown Acid compilations, and Japan’s DMBQ unleash a brand new avant-rock beast on Ty Segall’s Drag City imprint, ‘GOD?’. Earth Records have clearly poured lots of love into their reissue of the original music for Bagpuss, with beautiful art prints and liner notes from Daniel Postgate, Andy Votel, Stewart Lee and more. Plus we've got big catalogue reissues for Kate Bush as well as Brian Eno’s infinitely influential early Ambient series! We’re not afraid to get in the festive spirit a little before December’s officially here, and it seems you lot aren’t either, having completely wiped out our Vince Guaraldi Peanuts Christmas LPs!! 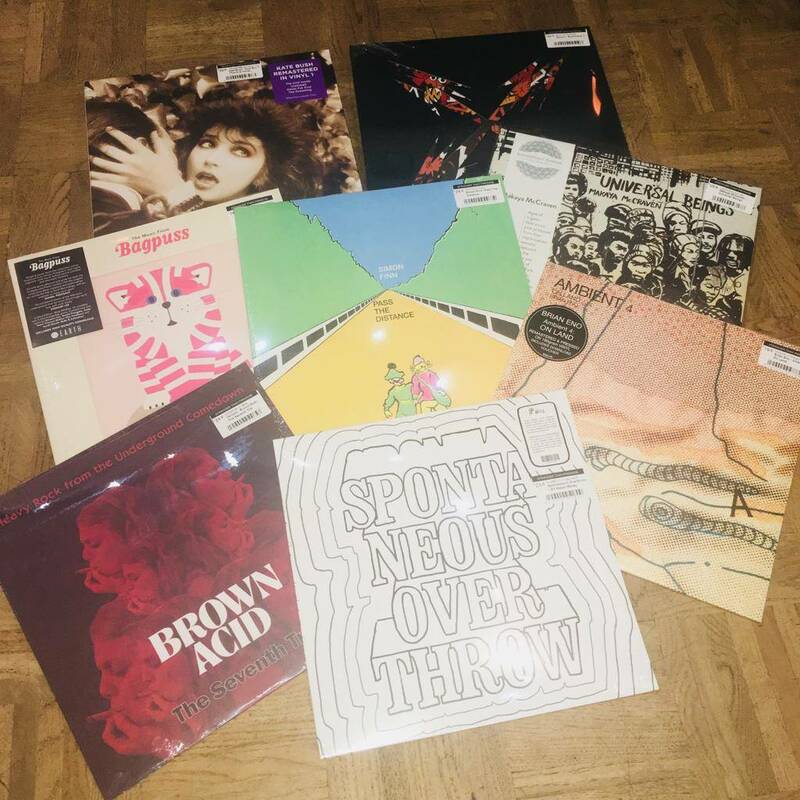 Keep your fingers on the trigger for an imminent re-stock, and in the mean time check out our other Xmas delights from Sufjan Stevens, Khruangbin, JD McPherson and more. Check our full catalogue of new releases, plenty more great stuff from Powell & Wolfgang Tillmans(!!! ), Numero, Awesome Tapes From Africa, Mayhem, Ryley Walker, Liminanas + too much more to shout about here!